A few weeks back a fellow classmate of mine asked me for some tips for the Nikon D300 which we both have. I agreed I would post a few that I knew of for her. Unfortunately I have been busy and to be honest I could not remember any D300 specific tips that is till now. My D300 was preloaded with 4 Picture Control settings from the factory. 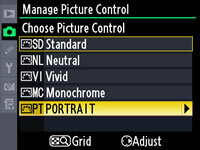 Now for those of you who don’t know what the picture control settings are, take a look under the “Shooting Menu” in your camera. There you will find “Set Picture Control” which allows you to choose a preset that allows you to apply a post processing setting to your image after it is shot. My D300 had Standard,Neutral,Vivid and Monochrome installed. Different Nikon cameras may have more. When I started using Lightroom and I downloaded the camera profile presets, I noticed there were way more than my camera had so I did some searching on the net only to find out there yes there were some more I could download.